Happy 144th Birthday, Canada! 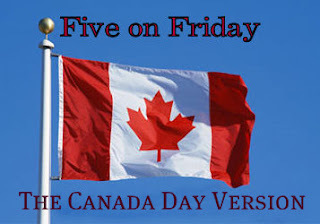 To celebrate I'm continuing my Canadian music series here on Five on Friday with five more songs from bands that you may or may not have known hailed from the land of my neighbors from the north. As a matter of fact both Amanda and Jamie were quite surprised to find out that "The Safety Dance" originated in Canada! Learn something new every day, kiddies! Have a great Friday and don't forget - "you can dance if you want to!" I love your choices today too. I love a good dance record! I forgot to wish Happy Canada Day to my friends in the north! Yikes!